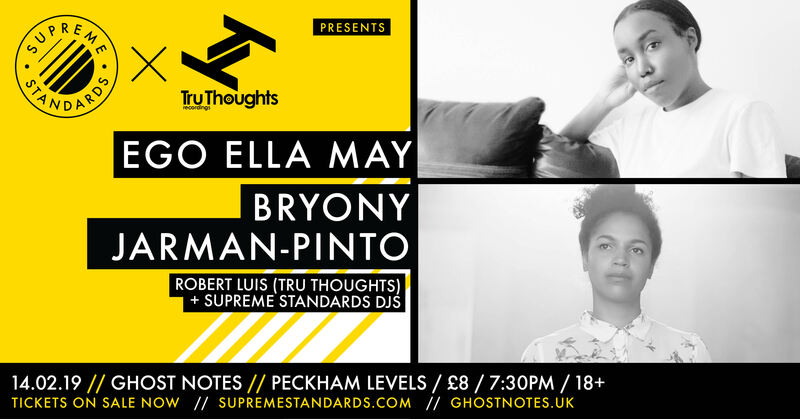 Tru Thought records’ latest signing Ego Ella May and label mate Bryony Jarman-Pinto headline our live show on 14th February at Ghost Notes. London vocalist Ego Ella May has been gaining attention as one to watch; her soulful voice and expressive performances make her an incredibly engaging front woman. Check out her Boiler Room set, kicking off with the memorable ‘Table For One’. Spending her formative years in Cumbria and Glasgow, Jarman-Pinto has been championed by various music communities. She was signed to Tru Thoughts after lending her voice to two celebrated artists; producer Werkha and trumpeter Matthew Halsall. Expect a solo release on the way and a taster at Ghost Notes on 14 February. As the co-head and A&R at Tru Thoughts Robert Luis is the perfect DJ to bring in for this show. He’s a veteran selector and has been holding down various residencies in Brighton for years, most recently ‘Sonic Switch’ where he plays for 5hrs. Closest train station: Peckham Rye.